Have you ever wished that you didn’t have to deal with blank faces and a snoring audience when delivering a slide about a technical aspect of your topic? One way of avoiding the inconvenience of talking to yourself during a presentation can be done by adding a video to your slide to allow your audience to easily understand a complex concept or to walk them through the use of a product. 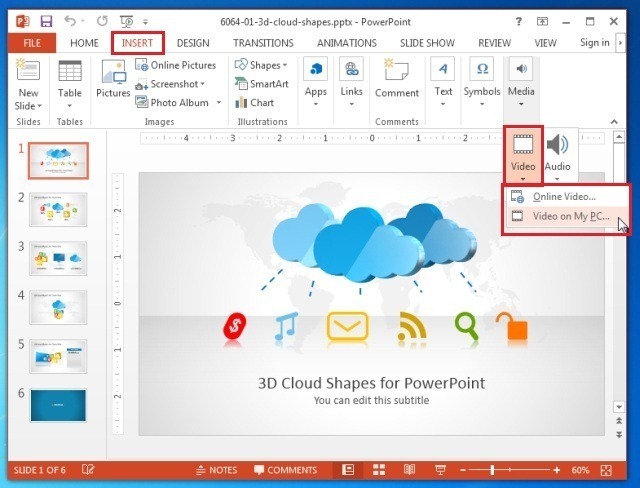 PowerPoint 2013 unlike its predecessor enables adding offline videos from a wider variety of formats and also provides some interesting options for adding videos from online sources, including YouTube and Facebook, as well as videos from your OneDrive account. 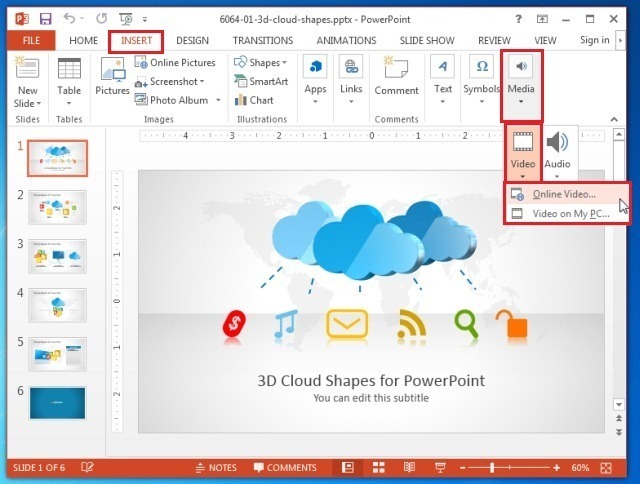 Let’s take a look at how you can add videos in PowerPoint 2013. 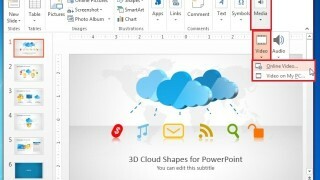 For the purpose of this post we will use the 3D Cloud Shapes Template for PowerPoint. To add a video from an online source to PowerPoint, go to Insert-> Media-> Video-> Online Video. In the next step, pick an online source to insert a video from, search for your video, select the video and click Insert (as shown below). You can insert videos from Facebook, OneDrive, YouTube and other online sources. You will require signing in with your Microsoft account to enable a few of the online sources not visible by default. To login to your account, go to File –> Account –> Sign in. Inserting videos from YouTube to PowerPoint have unfortunately seen a lot of hiccups, with no immediate remedy provided by Microsoft, therefore, you can also use the iSpring Pro add-in to circumvent any issues that might occur when adding videos from YouTube to PowerPoint. Simply install the add-in and click the YouTube icon from the iSpring tab in PowerPoint. Once done, paste the URL of the desired video to add it to your slide. 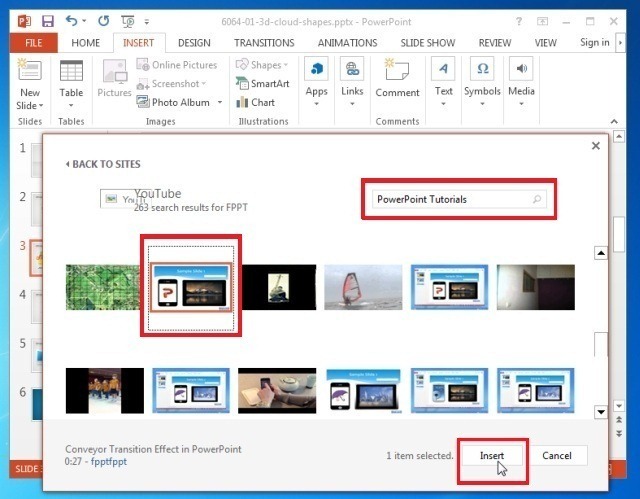 You can also click Preview to view your videos in PowerPoint 2013 before inserting them to slides. 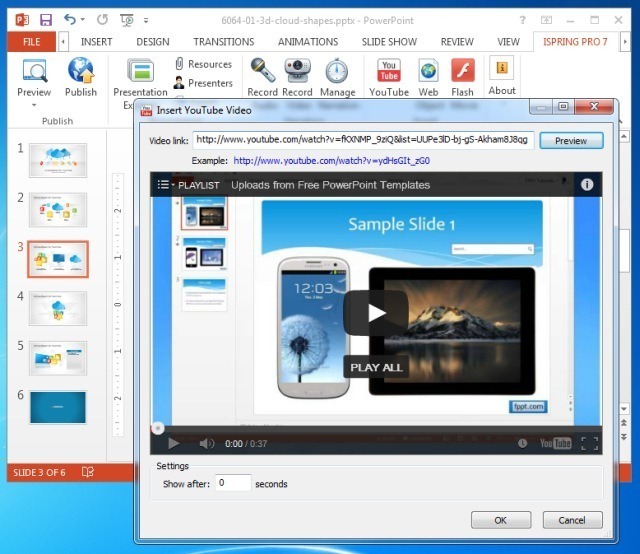 The below video shows a walkthrough of the process of adding YouTube videos to PowerPoint using iSpring Pro add-in. To add a video from your computer offline, go to Insert –> Media –> Video- > Video on my PC and select a video from your PC. 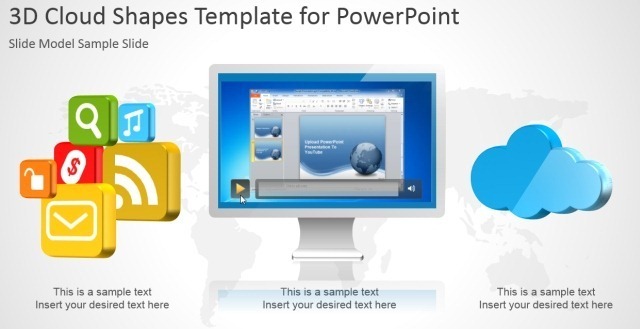 PowerPoint 2013 provides support for a wide variety of video formats which includes not only WMV and Mp4 videos but also videos from other popular formats including; AVI, ASF, MPEG-2, MOV and Flash (SWF). To ensure that there are no playback issues, you should keep the presentation and video file in the same folder and preview the video playback in Slide Show mode before your presentation. When adding videos you can get creative using some interesting templates. 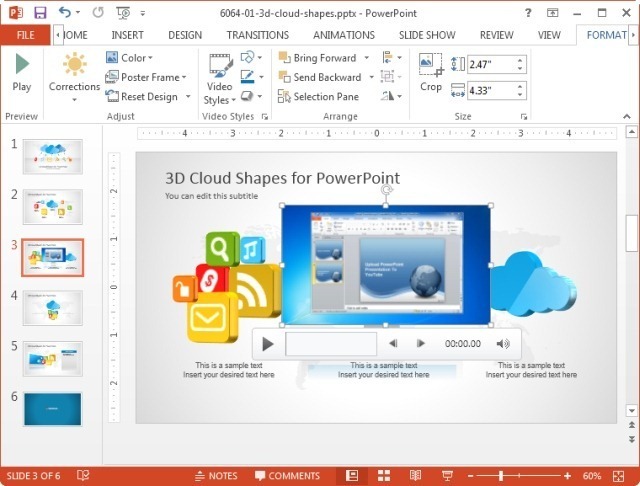 For example, we added the video to the monitor screen in the 3D Cloud Shapes Template for PowerPoint. Adding videos using such creative ideas can help you create attention grabbing presentations, which will appear both professionally made and visually appealing.